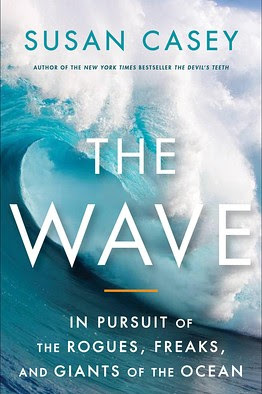 I half-expected that reading Susan Casey's book The Wave before bedtime would give me nightmares. Around ten years ago, I would occasionally dream of standing on a pier, or near the ocean, and being powerless and rooted to the ground as a huge, monolithic wall of water raced toward me. I would wake myself up, crying out and panting hard to catch my breath. Awful! Thankfully I don't have my "tidal wave" dreams too frequently anymore. But I've been fascinated with big waves since I was a child. Maybe it started when I was very small, watching the Poseidon Adventure in the theater with my dad. (And holy crap, did I just admit to seeing the Poseidon Adventure when it was first released? Egads.) Except "fascinated" isn't the right word -- it's more like, "extremely perturbed by their existence." The whole idea of rogue waves -- technically, waves that are freakishly large for the general surrounding wave-size -- really gets to me. For years, scientists believed the stories that sailors told for centuries of huge waves, rearing up from the sea to swallow a ship in one gulp, were just myths. Like mermaids, or sirens. Then they amended their beliefs to saying, "well okay, maybe there are rogue waves, but they happen like once or twice per century." 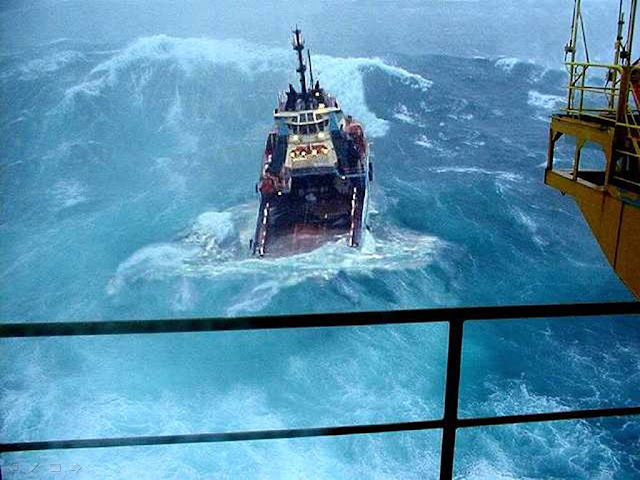 People, according to the scientists (and thanks to weather satellites), it now appears that rogue waves happen all the time, and that one or two huge container and freight ships are lost every month, swallowed by freak waves. Or maybe it was once a week. Suffice it to say: the rogues are out there. Indubitably, and undisputedly. The Wave didn't give me nightmares. It was an entertaining, smart and fast-paced read. Some chapters discuss the science and study of rogue waves, found out in the middle of the ocean, especially in the north Atlantic and near the tip of South Africa, where the warm waters of the Indian ocean collide with the frigid currents moving north from Antarctica. These chapters alternate with other chapters profiling big-wave surfers, like superstar Laird Hamilton, who pioneered the sport of tow-surfing (having a boat tow surfers way out to the big waves) and consistently surfs sixty, seventy, and even eighty foot monsters...just, y'know..for the fun of it. 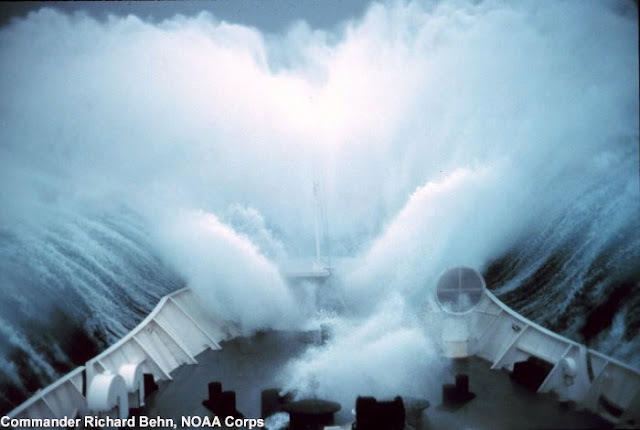 It is not reassuring to read the scientists admit that they're just now starting to get a grasp of rogue waves, and that they basically know nothing about why they occur. They also state that average wave sizes across the planet's oceans are rising every year, and this is attributed to the general warming of the oceans. Bottom line: bigger waves, and bigger waves more often. The Wave didn't help me get over my dread of big waves. I still find them fascinating/perturbing. It's a visceral reaction, a gut thing I feel when confronted by that much power. I feel the same way when I look at huge icebergs, too. Something about the very quiet, very inhuman force of nature, rising up to obliterate everything in its path. Looking at those images makes me want to put my forehead on the desk and quietly weep. And hope that I never, ever, get the opportunity to take a photograph of one for myself. Wave images from the aptly named site deathwaves.com.